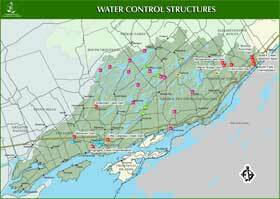 One of the Cataraqui Region Conservation Authority’s primary responsibilities is the management of water. Our focus is protecting natural waterways, controlling flooding and maintaining water levels during the drier summer months. To control flooding and to maintain water levels throughout the drier summer months, the CRCA has constructed dams, reservoirs, channels and detention basins. Although flooding has not been a major problem in our watershed, it has been an occasional challenge in some of our urban areas. The operation of these water control structures minimizes the impact of major storms. Operating any water control structure is a balancing act. In time of high or low water flow, upstream and downstream water control requirements often conflict. For example maintenance of lake levels for recreation may conflict with downstream needs for water supplies. The CRCA staff continuously monitor and adjust water flow and retention to balance these sometimes conflicting needs. There are lakes throughout our watershed that are controlled by dams owned and operated by other agencies or private companies. These dams are operated for a variety of purposes including power generation, navigation and water management. The CRCA does not have control over how these structures are operated. Who Owns and Operates the Dams? The CRCA operates seven dams and three water control structures.